Stephanie Osborn’s Displaced Detective series is about Sherlock Holmes as transported to the modern day via the hyperspatial physics of Dr. Skye Chadwick. In books 1 and 2 of this series, Holmes and Chadwick solved some mysteries, then fell in love. (These books were reviewed here.) So what happened next? Lucky for us, Ms. Osborn’s third novel in this series has just been released by Twilight Times Books; it’s called THE CASE OF THE COSMOLOGICAL KILLER: THE RENDELSHAM INCIDENT. Here, we have a possible UFO, another mystery — was a local farmer killed by the UFO, or not? And if not, who killed him, and for what purpose? — and we also have more romance between Holmes and Chadwick, along with a new threat to the entire cosmos, which only Dr. Chadwick may be able to solve. 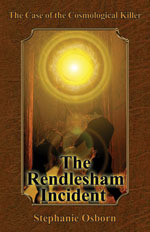 THE RENDELSHAM INCIDENT (for short), is packed with action and plot, but it may not seem that way at first. After a jam-packed introduction, the book quiets down to show more of Holmes and Chadwick’s romance — something I found very welcome — but this isn’t as idyllic as it seems, either. This is because Holmes’s subconscious is working overtime; he keeps dreaming that he and Chadwick are separated by a thin barrier, and he doesn’t know why. But there’s an additional problem; as Holmes and Chadwick dig deeper into this “UFO” that everyone is worried about, Chadwick gets contacted by her “other self” — that is, a Dr. Skye Chadwick from a different dimension. That Dr. Chadwick also invented the Tesseract, and also “imported” Sherlock Holmes before he could get killed on the rocks of Reichenbach Falls — but that Chadwick and Holmes did not have a lengthy romance, much less get married. Worse, the incident in THE ARRIVAL that killed one of our Chadwick’s team ended up killing most of the other-Chadwick’s team, including Chadwick’s best friend in any dimension, Caitlin Hughes, which has had a terrible effect on other-Chadwick’s morale. This is the main reason why other-Chadwick has contacted our Chadwick-Holmes; other-Chadwick needs help to figure out why the multiverse seems to be on the verge of imploding or exploding. (This isn’t exactly what’s happening; the universes being in danger — the cosmos, in short — has something to do with the use of the Tesseract device. By the time other-Chadwick comes to our Chadwick-Holmes, things have rapidly worsened. Thus other-Chadwick’s solution.) And because both universes that contain a version of Chadwick and Holmes are fairly close, if our Chadwick-Holmes cannot help other-Chadwick, it’s possible that these two universes will end up disappearing — and taking much, if not all, of the rest of the multiverse out with it. Overall, the romance in THE RENDELSHAM INCIDENT is superb, especially when contrasted against the failed romance of other-Chadwick and other-Holmes. The physics, once again, are rock solid, yet understandable for the intelligent layman. And the underlying mystery as to what happened to farmer McFarlane, much less how Holmes gets to the bottom of the various layers of this newest case, is extremely interesting. Thus far, Ms. Osborn’s writing quality has continued at a very high level. Which is why despite the quiet section that lasted nearly 75 pages (yet contained very many plot points that were vital to understand what happened for the remaining 200+ pages of the book), THE RENDELSHAM INCIDENT held my interest from beginning to end.